These resources are free to use and do not require my permission. As a courtesy, however, I would like to know which projects they will be used for, if you so choose to use them. The only thing I require is that you credit me if you decide to use these resources. Thank you! Rounded water autotile with animated surface. I only created the surface animation, and do not take credit for the original autotile. 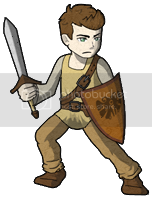 I found the autotile on neoseeker, and unfortunately was unable to find out who the original artist is. These banners have been stripped of their designs to offer a more customizable template. These tiles were taken from the original RTP and modified. I am not asking for credit for these particular tiles. They look pretty nice. Good work! I've added three (well, two and one re-color) battlers, and I have a few more drawings that need to be colored, and I'll be adding them as soon as I can. Added a few more battlers in the previous couple of weeks. 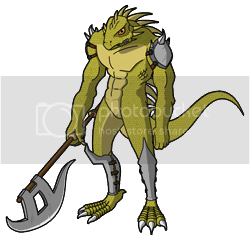 The newest additions are the Imp and Frog-like battler (called the Anura in my game). just gonna go ahead and say character sprites aren't chipsets. I'm sure anyone browsing this thread would understand I was not referring to the kind of chipsets you've referenced. I was simply using typical RPG Maker jargon, disregarding technicalities. "Sprite sets" is a more suitable description. Also, Tilesets are referred to as chipsets according to the RPG Maker XP wiki page. Tilesets are called chipsets by Enterbrain because of how the chipset affected the use of sprites in the systems they were used in. That doesn't make sprite sheets chipsets. Back on topic: I like the cartoonish style, though I never was a fan of colored outline sprites. Thanks. I have to agree with you regarding the colored outline on the sprites...it does make it somewhat difficult to distinguish them from the tiles (e.g., green worm sprite on green grass). 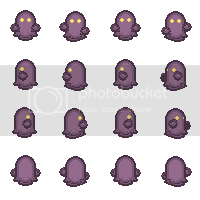 I may post some black-outlined sprites in the near future. well, at least a darker shade of color. Those monster sprites makes me want to come over there & hand shake you personally. Added the Imp sprite set! Thanks! I try to add a new drawing or two weekly. I'm a little behind schedule right now, should have a couple new ones up soon. Added another battler! 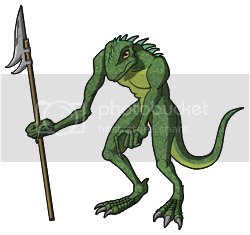 This time it's a spear-wielding lizard monster. I'll be adding another version of him wearing armor soon. Thanks for the compliment! For the battlers I sketch them on paper, then color them using Adobe Photoshop CS4, and for the sprite sets I use MS Paint. For the worm and plant guy sprite sets I used Photoshop for the outlining. Yeah, I am impressed as always. Good stuff. 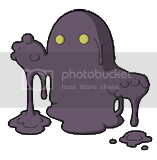 Added the sprite set for the Mudling battler. 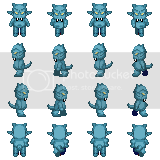 In creating my game, I realized some of the sprite sets (Worm, Sprout guy, and Mudling) did not have their animations lined up. I went ahead and corrected this. I'm a little late on my one-drawing-a-week schedule, but here it is, a lizard brute creature!